"MARS By SHEROES Is A Game Changer For Work-From-Home Professionals"
I recently read a report in news publication THE WIRE. Let me share it with you all before we move to the story of the day. Why? Well, it has a deep-rooted relation to women and women-work-force. In rural areas above the age of 15 was 33.0% in 1992 and 25.3% in 2011. The same statistic for urban women fell from 16.5% in 1993 to 15.5% in 2011. The share of women workers in the country is falling – it has gone from 34.1% in 1999-2000 to 24.2% in 2011-12. Such is the sad state of affairs towards women employment in India. And we all know that a large stratum of women wants to work, but are either not allowed to work or not taking up a career due to various external factors But then there are ways to break such barriers. And today I take you to meet Ramandeep Chugh who has paved the way ahead for various other women to follow and take a leap of faith towards independence. Bhopal, Madhya Pradesh based 36-year-old Ramandeep Chugh who is employed with a top organisation. She explains it as "I work remotely from home since I have to look after a family. 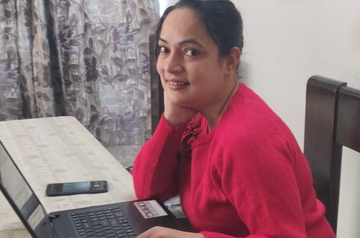 And I got to know about this Work-from-Home solution called MARS, for women who have the urge to work (even if from home) but don't get an opportunity." A commerce graduate, Ramandeep informs that she was the youngest and most-cared for child of the family. Before marriage, she was a working professional for brands like Airtel and Idea. But post-wedding after settling in an Indore based family, her life revolved around her husband, in-laws and later children. She has two daughters aged 12 and 4. And she hopped jobs while raising them. But she had to first move to Gwalior and later Bhopal when her husband's job shifted places. Ramandeep began detailing, "My husband is currently VP-Operations with an MNC in Finance Sector. And the wife mostly has to move with the husband. But I was always keen on working. I have seen it all, from digging my eye into newspaper classifieds to falling prey to fake job websites - I have had it all. One day my friend Supriya introduced me to SHEROES where I learned about MARS. My first job through SHEROES was a very basic one. And my second project is ongoing now, with a top company." Next, she details about MARS and what kind of commitments are required to fit in a Work-From-Home environment. "Mahima, I got to know through a friend that SHEROES has set up something called MARS - Managed Remote Solutions as a leading business solution in which SHEROES has certified women workforce that works for various clients all across India - BUT FROM A REMOTE LOCATION! Currently, I am a part of the on-boarding project of Executives who are engaged at providing an end-to-end process of verification and authorizing documents within the stipulated time frame. It's my first dedicated work from home and completely love and respect it. The remote team, as well as team leaders, are quite supportive,"
But she says it is not that easy as it sounds because working from home has a lot of distractions unlike, office places. And she has to really focus and make the family also focus and be aware of her work-space and commitments. She details," It is a typical 9-5pm job but from home. I have to plan my day really well so that my work and personal life are properly aligned. MARS has not only helped me discover a NEW ME but has also taught me how to prioritise things in life. Working from home is also quite demanding. Not always the day will progress the way you want to since you are working from home where you have an equal commitment towards the family. But with time my family, especially my daughters have conditioned to the fact that Mumma too has office work now. They have become more supportive and responsible. I feel to see my younger one helping me out to sit for work on time. But it needs a lot of focus and determination to stay focused," very joyful Ramandeep shares all this with pride. You will be happy to know that while juggling work and family, Ramandeep also finds time to unwind through her hobbies which include Yoga, cooking, trekking, participating in marathons and listening to music. She laughs and says, "Yes Mahima, after speeding up my work, I go for short Yoga sessions to rejuvenate myself. And I end my day with short readings. We all need that ME TIME, isn't it?" I can feel the joy in her voice as she adds, "SHEROES is that perfect jigsaw for those women who are into family commitment but desperately looking to make their own identity. And I am all set to attend the SHEROES SUMMIT 2019 which is being held in January. Now that I have experienced Work-From-Home through MARS, I don’t want to stop in life and stride ahead, even if my work demands more of me. I am rather looking forward to more challenging projects, that can extract my best talent!" And here I feel like shouting out to everyone and anyone who thinks that women don't want to work: Hey, you there...come here and meet women like Ramandeep, who are trying to excel, hanging to a thin but strong rope of hope! They wish to excel, all they need is an opportunity." "You can do more than you think. So DO NOT let others define your worth. Take the chance, rise, and shine." If Ramandeep Chugh has left you motivated, do share her story and don't forget to pour some love for this SHERO in the comments column! Hi, I am Paulami, I too left my job often and on due to many external issues. However, I want to bounce back and create my own identity and also want to be financially independent, please suggest me few options and suitable openings. What is the nature of your job? Pls tell me how is it work? its realy inspiring..nd m also interested in work frm home..
Hello Mahima, Thanks for sharing about MARS, from many years I am looking out for an WFH. I had got a chance to WFH in my MNC for few years. But now they are not allowing me to WFH.I don't want to end my career so soon. This is a very good opporrunity for me to explore. Please share more details about it on how to join and proceed further. I m also interested.. Mam pls share the details how to get connected..
Hi. It's great to know about some good work opportunity that you have got. Could you share details about MARS and also how to connect with it? It's really great to know about MARS .I am also looking for work from home. Many women are willing to work and be successful in life. But they don't get opportunity. They will not have anybody to guide them or show them the way.In this way they will be wasting their precious time.I request SHEROES to explain in detail about this and help women who are in need of work. Great. I also want to work. But because of tranferable job of my husband, I feel something like work from home will be a great idea. But it is so difficult to find an authentic one. If any interesting real jobs share it here gals. Hi...loved your experience that your are facing...even i would like to do sumthng from home...plz do.tell me if nethng worthwhyl..
You can click on the following to get the process started. https://www.surveymonkey.com/r/MARSbySHEROESRegistration. If you are sincere, dedicated and committed we would love you to join MARS. Interested. Pls tell me how i can join. For the first time I heard about MARS..and reading this I am desperate to be a part of it...as I am at home looking after family and I want to work...I am juggling from last many years infact.. thanku mahima mam for this article....and Ramandeep mam....grand salute....u r a true example ...of those who come under this dialogue forum...agar Kisi cheez ki shiddat se chaho toh Puri kaynat apko milane ki saajish krti hai....!!!!! I m super xcited to come to know abt such women of remarkable content.i m totally inspired.to know abt myself i wish to tell i m a down to earth person with distinct values.i ma fighter for a better future.i want to work for deprived women at large.now im pursuing law. I want to join but how.. ???? First of all I didn't know so much about MARS. Thank you for bringing up this, Mahima. Ramandeep, you are true inspiration for many here. Hi mahima m also interested in work from home thing please provide some details about that..